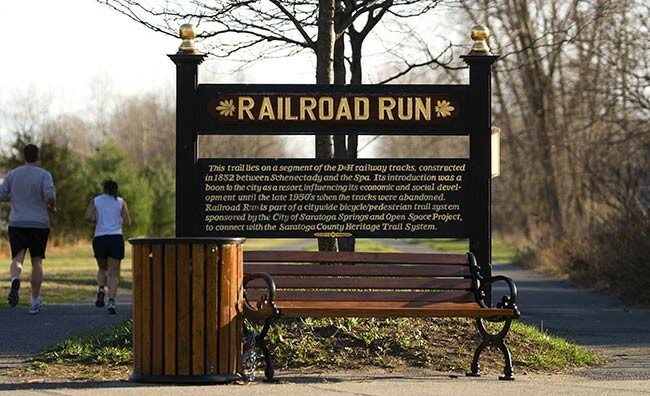 Railroad Run is a half-mile trail in Saratoga Springs connecting West Circular Street to Congress Avenue. The trail is owned and maintained by the City of Saratoga Springs. Stone dust on one side and asphalt on the other, the trail is used for walking, bicycling, rollerblading and skateboarding. In June of 2013, after 10 years of planning, the trail was extended south across Route 50, and a crosswalk and traffic light were installed, linking Railroad Run to the Saratoga Spa State Park for pedestrians, wheelchairs, and bicyclists. Plans are to eventually connect the trail to the Zim Smith Trail in Malta.